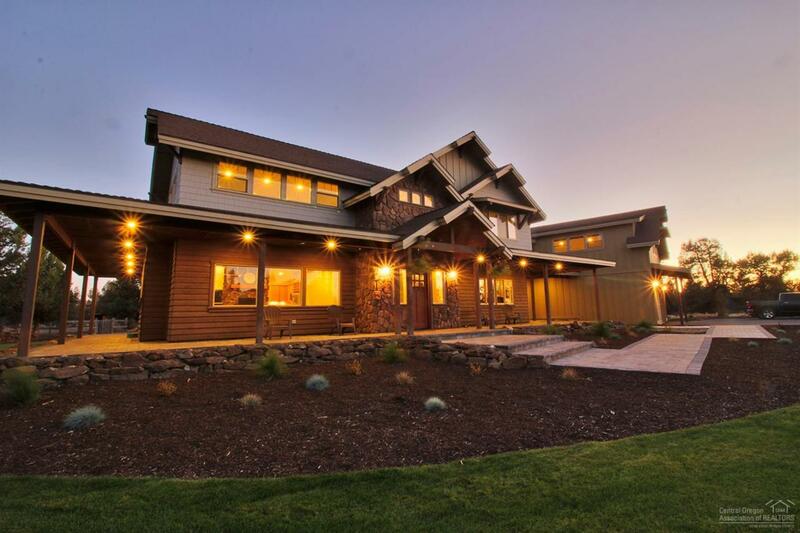 This unique 4,800 sq ft home nestles between Smith Rock and beautiful Lone Pine Valley. This special property offers unsurpassed space, tranquility and privacy with great views of Smith Rock throughout. Travertine, granite and light colors combine with wood and stone accents for a bright craftsman feel with real western charm. Many windows bring in natural light and the beauty of the outdoors year round. Two master suites on the main floor offer great separation and privacy while upstairs bedrooms are oversized and share a large double sink bath with separate shower/tub room and water closet. Upstairs bonus/guest room and a rec room as well as a library/office on the main level. The 1,000 square foot shop has electric and a cement floor. The main irrigation canal borders the west and rimrock cliff to the east and only 4 other nice larger homes that share what used to be a 100 acre estate. Although private it's just minutes from shopping and dining in Redmond and beautiful Terrebonne. Listing provided courtesy of Jeff Larkin Realty.